High quality double shielded 4 BNC to 4 BNC RGB cables. These cables are made for carrying the highest quality RGB video signals for high end graphics workstation s and RGB monitors with RGBHV inputs. Four male connectors include red, green, blue and composite sync with internal coax lines. 5 Color-coded conductors for easy identification. 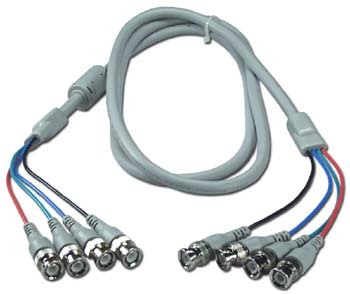 Five male connectors include red, green, blue, horizontal and vertical sync with internal coax lines. Fully supports YPbPr and YCbCr component RGB high resolution video standards for HDTV. Supports highest RGB resolutions for computer workstations, video monitors and projectors using RGB signals.